Distinguishable from European species by lack of dorsal lateral fold, very large eardrum and vocal sac being beneath the chin. 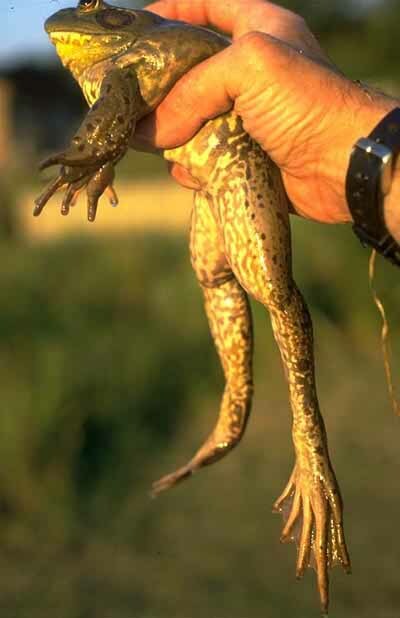 The large eardrum and lack of a dorso lateral fold (see Common Frog ID page for comparison) help to distinguish this species from the superficially similar though smaller, Green Frogs such as the Marsh Frog that have been introduced to some areas and the native Common Frog. Ventral surface, whitish, mottled or spotted with grey. Breeding occurred at a site on the Sussex and Kent border, efforts were made to exterminate it. 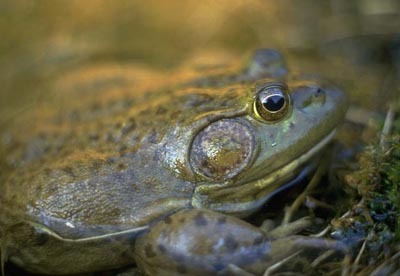 Exotic - The American Bullfrog is a voracious predator and a serious threat to British wildlife. Tadpoles of the American Bullfrog were at one time widely sold in garden centres, imports are now banned due to the risk of this invasive species establishing in the UK. Vigilance is still required as there have been reports of accidental introductions of tadpoles included with consignments of aquatic plants. Male American Bullfrog. Note large Eardrum and lack of Dorso lateral fold. Release of exotic species into the wild is a criminal offence under the Wildlife and Countryside Act 1981. This includes introduction of exotic or alien species that may already have become established. The interpretation of "wild" in the act includes private gardens from which escape is possible.